Providence, RI (6/28/2018): The Rhode Island Reds Heritage Society has announced that former Reds and NHL great Rick Middleton will appear at the organization's 18th annual reunion event at Goddard State Park in Warwick on Sunday, August 5. Middleton spent only one season (1973-74) with the locals as a N. Y. Rangers farm hand while easily becoming the most recognizable and popular player on the team. That year the young right-winger scored 36 goals and had 48 assists, good for 84 points, while earning the American Hockey League's rookie-of-the-year honors. He was quickly promoted to the NHL and played two seasons with the Rangers before being traded to the Boston Bruins. 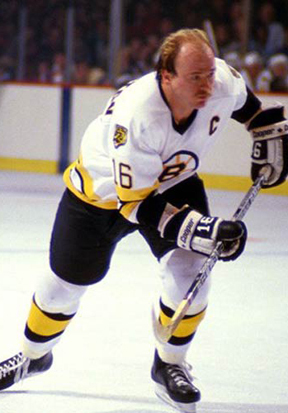 It was with the Bruins the next 12 seasons that Middleton earned the deserved nickname "Nifty" for his puck-handling skills as he slickly became one the league’s most feared and deft goal scorers. During his 13 seasons in the NHL his records for regular season and playoff games were 493 goals and added 595 assists for a total of 1,088 career points. The annual Sunday event, which starts at noon, will feature introductions of each hockey hero on stage, the Society’s annual awards presentations, a delicious buffet dinner, music, raffles, and a silent auction of valuable hockey memorabilia. Cost is $35 per adult, $15 for children. As an added weekend treat for fans, the reunion’s annual dinner dance on Saturday will feature guest speaker Jack Edwards, Boston Bruins' broadcaster, at the Chelo's banquet facility on Post Road in Warwick. Tickets are $50 per person. For information and reservations to each event, contact Mal Goldenberg at 401-782-6623 or mal@rmcri.com. Deadline for reservations is July 16. Tickets will not be sold at the gate. Former Reds and Bruins great Rick Middleton will appear at the RI Reds Heritage Society's 18th annual reunion.